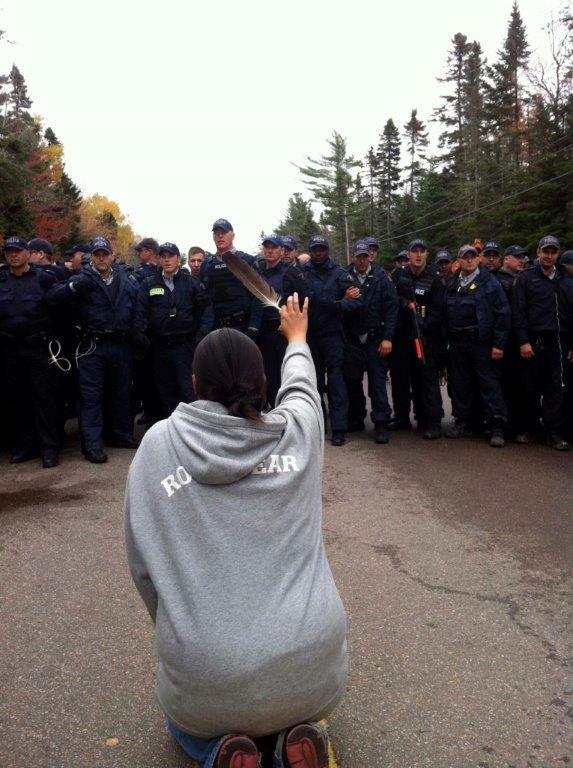 Winnipeg - A kneeling Indigenous woman brandishes an eagle feather in front of riot police. Two girls in bunny hoods play near a smoking petro-chemical refinery. A woman wearing a white hijab head-covering raises her hands in a gesture of prayer. 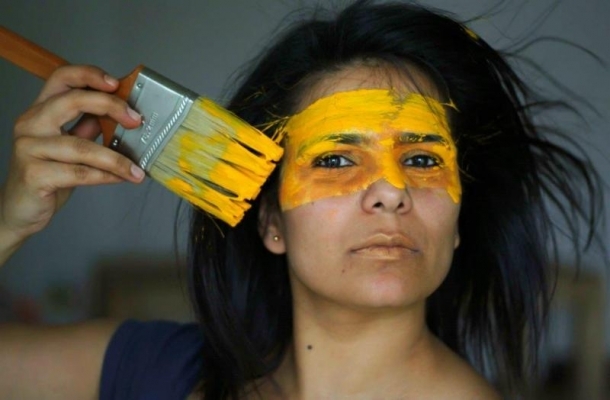 These award-winning images are among 70 photographs chosen from almost 1,000 submissions received from across Canada for an exhibition featuring widely diverse expressions of human rights issues. Points of View opens tomorrow at the Canadian Museum for Human Rights (CMHR) and runs until February 4, 2018. It includes 3D tactile versions of the five award-winning photographs, enabling visitors who are blind to "see" the art through their fingertips. Each photo in the exhibition is accompanied by captions that reflect the photographers' own views on the human rights themes reflected in their images. "These photographers present us with a panorama of diverse perspectives through their images and their personal lived experiences with human rights," CMHR president and CEO John Young said. "Each story they tell is truly worth a thousand words - reflecting resilience and resistance, dignity and compassion, and the challenges that continue to confront us. We hope these photographs help foster a deeper understanding of human rights and inspire our visitors to pursue the hard work required to promote human rights for all." Photographs in the exhibition - the third of four presented by the CMHR this year to mark the 150th anniversary of Canadian Confederation - were chosen by a multi-disciplinary jury drawn from across Canada. The CMHR today announced awards for best photograph in each themed category (Reconciliation; Inclusion and Diversity; Freedom of Expression; Human Rights and the Environment), the best youth submission, and the best photograph of the exhibition. These photos have also been turned into sculpted, 3D images embedded with tactile audio sensors for visitors with visual impairments. The award recipients are listed below. Voting for a "People's Choice" award begins tomorrow in gallery and online, where all the photos in the exhibition can also be viewed. Voting ends January 7, 2018, with the award recipient to be announced on January 16. A beautiful, soft-bound book presenting all the photographs featured in the exhibition has been produced, and is available for sale in the Museum's Boutique. It will also be available to order online. The book contains a foreword by Young and an introduction by curator Jeremy Maron, as well as statements from the jury. The photographs in this exhibition now become part of Canada's national collection and, as such, will be accessible to researchers, scholars and the general public in perpetuity, helping preserve an aspect of Canadian heritage for future generations. The images and captions capture and reflect the human rights dialogue of a very specific point in time today in our country, preserve this moment for the future, and exhibit it to encourage further reflection and dialogue. The Canadian Museum for Human Rights is the first museum in the world solely dedicated to the evolution, celebration and future of human rights. It is the first national museum in Canada to be built outside the National Capital Region. Using multimedia technology and other innovative approaches, the Museum creates inspiring encounters with human rights appropriate for all ages, in a visitor experience unlike any other.